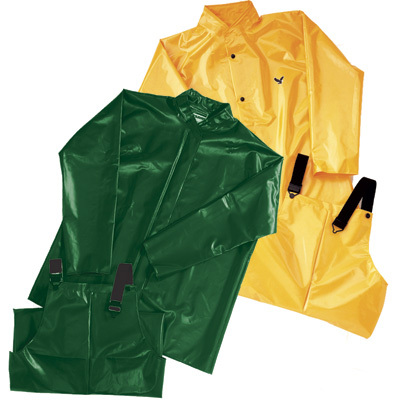 The Iron Eagle exterior coated polyurethane on nylon jacket is lightweight and durable. Extremely comfortable and flexible, the Iron Eagle also has the durability to resist fats, oils, pine tars, gasoline, grease, and a variety of other chemicals. It is ideal for the toughest work conditions. ● Polyurethane on nylon green jacket. ● Batwing sleeve construction and generously cut for maximum freedom of movement. ● Storm fly front seals out wind, rain and contaminants. ● Hood snaps compatible with Iron Eagle hood (H22148). ● 2 mil exterior coating offers unbelievable snag and abrasion resistance. ● Sleek coating is easy to decontaminate and provides great liquid shedding characteristics. ● Therm-O-Rad sealed seams are stronger than the material itself and can withstand extensive laundering. Ideal Applications: Food Processing, Sanitation, Meat Packing, Forestry, Agriculture and Petrochemical. Chemical Resistance: Good in most hydrocarbon oils, organic acids, salts, alkalies and in some organic solvents. Not recommended in ketones, alcohols and certain solvents.